First they invaded the waters off the West Coast of B.C. 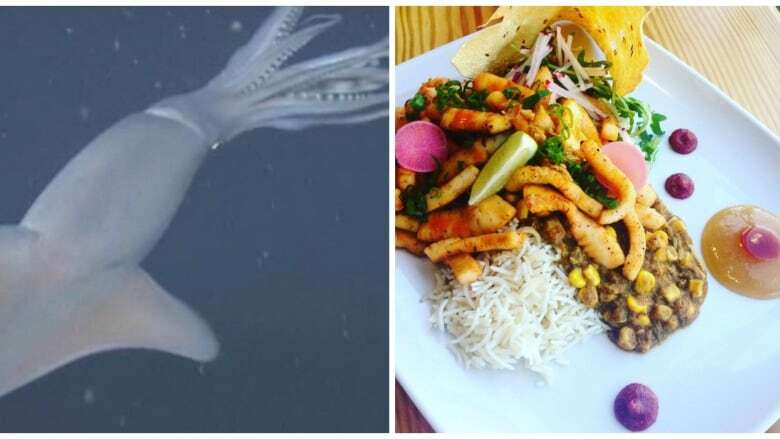 Now the Humboldt squid, an aggressive, man-sized predator, is landing on restaurant menus on Vancouver Island. First they invaded the waters off the West Coast of British Columbia. Now the feared Humboldt squid is landing on restaurant menus on Vancouver Island. The man-sized cephalopod — also known as the jumbo flying squid, diablo rojo — is known to attack divers and fishermen. It is usually found in South America, all the way up to California, but it began appearing on the B.C. coast several years ago. Victoria's Fish Hook restaurant serves the squid in dishes ranging from calamari-like pakoras to masala-corn curry. Fish Hook owner Kunal Ghose says some customers are hesitant about trying the aggressive predator. "I tell them, how often in your life do you get to have an eat-or-be-eaten situation?" For Ghose, the Humboldt squid is a particularly welcome addition to the menu because it is the only type of squid that is recognized as a sustainable seafood choice by the Vancouver Aquarium's Ocean Wise program. 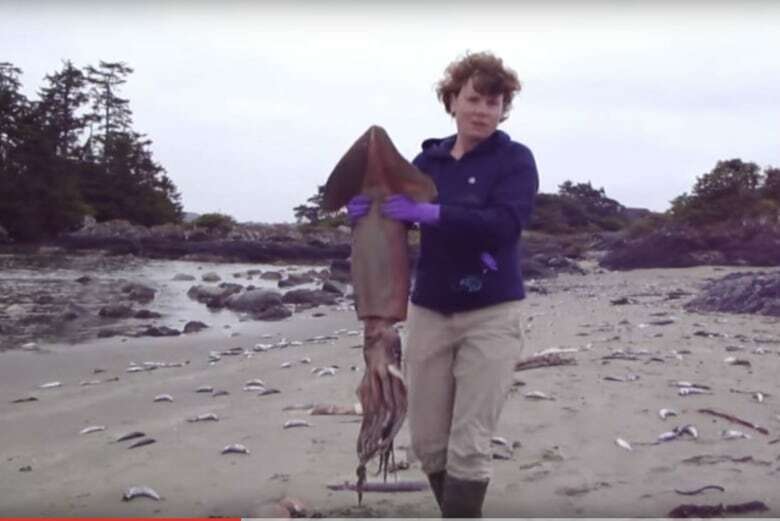 Tofino Mayor Josie Osborne remembers the first mass stranding of Humboldt squid in B.C. waters in the summer of 2009, when hundreds of juvenile specimens washed up dead on beaches around Tofino. Osborne, a biologist, might have been one of the first locals to take a squid home, cook it and eat it. "I knew enough about cephalopod biology to know eating the muscle wasn't going to be a dangerous thing to do." Since her first taste, Osborne says sightings of Humboldt squid have become normal, both out on the water and in town. "It's kind of funny to see that on a restaurant menu now and think, oh yeah, I ate that a long time ago," Osborne said. 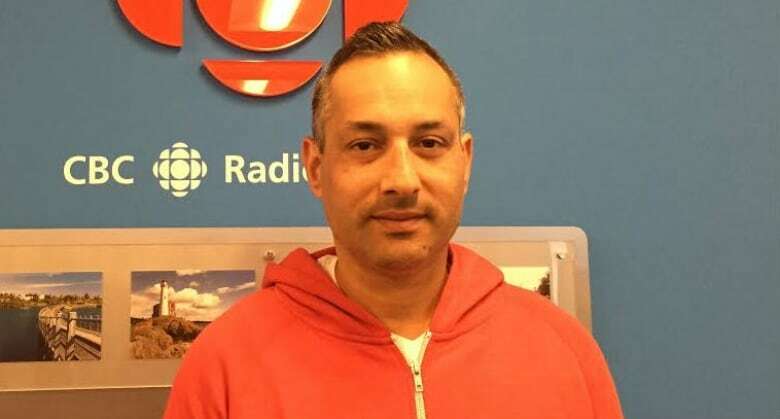 To hear the full interview, click the audio labelled: "Feared ocean predator makes leap to restaurant plates"
Jumbo squid warm to waters of B.C.